Born in Calcutta, West Bengal. Married to the grand son of Raja Ram Mohan Roy at the age of 11. 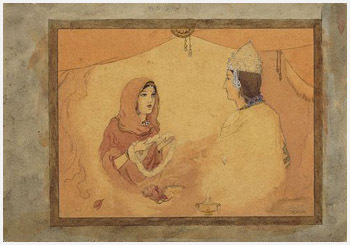 Her famous brothers Abanindranath, Gaganendranath and Samarendranath, inspired her to take up painting. Started painting at the age of 30. She took inspiration from Indian epics and mythologies. 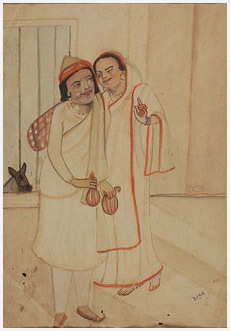 The theme of her paintings revolved around the characters of Krishna Lila, Ramayana, Mahabharata etc., and her style was highly influenced by Bengal Pata paintings. Established an art school called Kala Bharati, Calcutta. 1908, 10, 12 Exhb., Indian Society of Oriental Art, Calcutta. 1911 United Provinces Exhb. organised by Indian Society of Oriental Art, Allahabad. 1911 Festival of Empire, organised by Indian Society of Oriental Art for George Vs Coronation Crystal Palace, London. 1924 Travelling exhb. organised by Indian Society of Oriental Art and American Federation of Art, USA. The National Art Gallery, Chennai. Sri Chitra Art Gallery, Thiruvananthapuram. Rabindra Bharati University Museum, Kolkata.